Tear- and drool-proof, these washable baby books are filled with beautiful nursery rhyme imagery. Babies aren't always the sweet, gentle creatures they are perceived to be. Especially when books are involved. With IndestructiblesTM, however, babies and books can peacefully co-exist. These books are built for the way babies 'read': with their eyes as well as their hands and mouths! As the name suggests, these virtually indestructible and undeniably cute books are made from the same paper-like material used in shipping envelopes, which means it's 100% baby-proof: chew-proof, drool-proof, and rip-proof. Not only will these books resist tearing and gummy mouths, but they’re also completely washable! Made in China. Featuring energetic, colorful and beautiful paintings of classic nursery rhymes in exotic locales by Jonas Sickler, these simple and lovely books are completely visual and have no words throughout the story (they appear only on the back cover), which allows for plenty of imaginative storytelling from mom or dad. Indestructibles are intentionally wordless in order to encourage dialogic reading, or "natural conversation," between parent and baby. Dialogic helps an infant develop early literacy skill such as phonological awareness, vocabulary and narrative skills. Printed on a synthetic material made from non-toxic, flashspun high-density polyethylene fibers. It feels like paper, but liquid water cannot pass through it and it is very difficult to tear. These diverse indestructible books are great. Like the diversity in the books and that my 6 month grandchild loved to read and chew on the books. They are non toxic. Precious book. My grandson's name is throughout the book. My Little Grandson's Favorite Books! These books are amazing! Our daughter sucked on them, chewed on them, our dog even got a hold of one and they didn't rip or tear. Washing is a breeze to clean and sterilize. 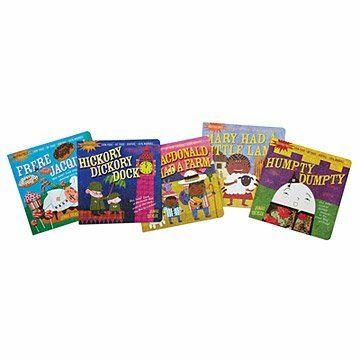 These were fantastic books. I bought them for 2 five month old babies and they were durable! These books are very durable. I love this concept of making up the stories, using different cultures but with familiar rhymes. It is a great way to inspire imagination, language and new ideas. The illustrations are too busy, there is just a lot going on which can be distracting. That said, it makes a great and unique baby shower gift. It's nice to have an indestructible book alternative to board books since they take up so much space on a shelf. These were much more compact than anticipated but they will be great for throwing in a diaper bag or leaving in a car. Also works for the new baby plus his older brother, who's 3. May be buying these for EVERYONE!